Apple's iTunes Radio has carved out 8 percent of the U.S. streaming music market, placing it ahead of popular service Spotify and just behind second-place iHeart Radio, according to newly released data. Pandora remains far and away the market leader with a 31 percent share, newly released figures illustrated by Statista, and highlighted by Electronista, showed this week. Coming in second place was iHeartRadio with 9 percent of the market, followed closely by Apple's iTunes Radio. That places Apple in third place, ahead of Spotify's 6 percent share, the data reveals. Google Play All Access took fifth place with 3 percent, followed by Rhapsody, Slacker, and TuneIn Radio, all of which held an equal 2 percent share. The figures from Statista are based on a 2014 survey of 2,023 Americans aged 12 and older. They are based on data from the Edison Research annual "The Infinite Dial" radio report. 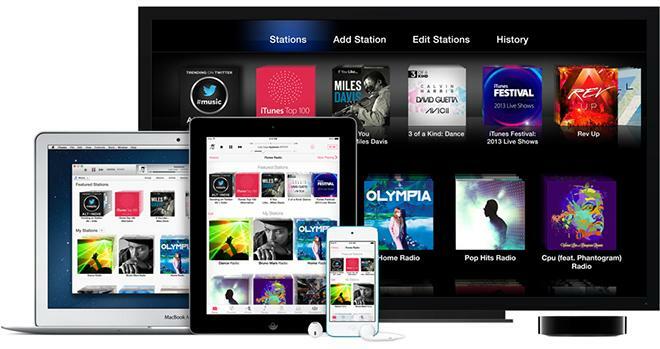 iTunes Radio launched alongside iOS 7 last September, and quickly reached more than 20 million users by October, having streamed more than a billion songs. iTunes Radio is available on iPhone, iPad, iPod touch, and Apple TV, plus Mac and PC through iTunes. Though it was initially limited to users in the U.S., Apple has slowly begun to expand iTunes Radio internationally. The Internet-based streaming radio service is free with ad support, while iTunes Match subscribers can listen ad-free with an annual fee.